We love talking about Nintedo's forthcoming Wii console almost as much as we like eating delicious chocolate. 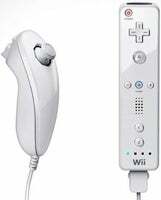 So the news that gaming megasite IGN got their hands on Nintendo's developer documentation for the Wii's spiffy remote control was like breakfast, lunch, and dinner rolled into one tasty meal. The docs answer a few questions about the controller: namely that it'll rely on alkaline battery power (in the form of two AA batteries), will contain 6KB of "non-volatile" memory (possibly for the controller's internal speaker, though it's not known for certain), and will talk to the console on the 2.4GHz band, via Bluetooth. There's a bunch more details over at IGN, including info on the controller's LEDs and the receiver hardware. Personally, I'm a little concerned about the use of the 2.4GHz band, which is already pretty heavily saturated with Wi-Fi and many cordless phone models. With this much noise on the frequency, could microwaving up a bowl of macaroni and cheese (a favorite gamer pastime) wreak havoc with your friend playing Zelda ? Cries of "no fair" and "lamer" will no doubt echo throughout the realm.